On the Cover: This enhanced false color mosaic of Landsat images covers a portion of the eastern Sahara. The Uweinat Mountain, 40 kilometers across, is the largest topographic prominence, and causes a vast spindle-shaped, sand-free zone. The mountain rises at the borders of Egypt, Libya and Sudan. Smaller features also cause a dark, sand-free zone in their lee. Similar features have been imaged by spacecraft orbiting Mars. 4 Detecting and Studying Extrasolar Planets: John Appleby and Arthur Vaughan describe at the technology aiding in the search for planets beyond our solar system. 8 Alien Life—Forms and Function in Fluids: James Burke looks at life on Earth to think about life on other planets. 10 Is It Earth...or Is It Mars? 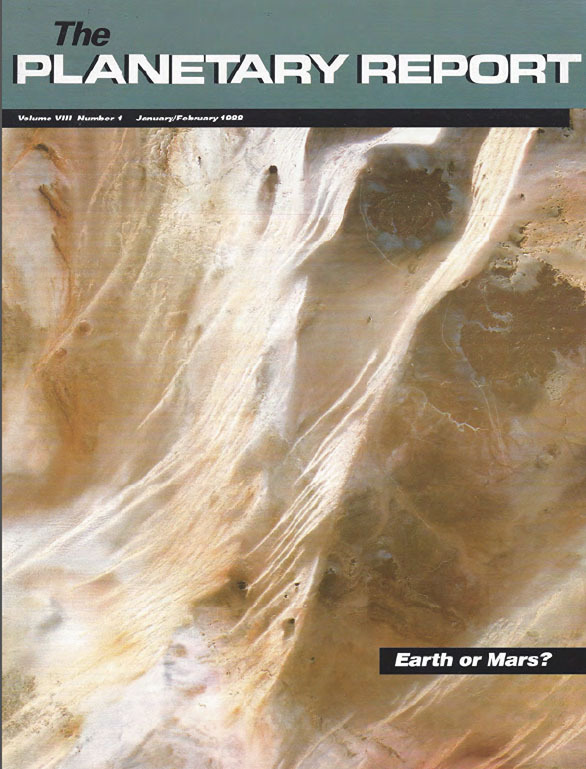 Farouk El-Baz compares the planets with satellite images. 3 Let's Reinvigorate the U.S. Space Program Carl Sagan and Louis Friedman ask: Has NASA lost its way? 7 Q&A What is the speed necessary for Galileo to reach Jupiter? 12 News & Reviews Soviets in space; where does NASA go from here? 13 World Watch The shuttle program after Challenger; Mars Observer and CRAF. 14 Society Notes New additions to the Society.